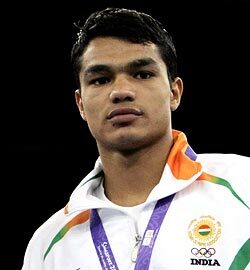 Confident but cautious too, teen boxing sensation Vikas Krishan (photo) will be aiming to go one better on his senior Vijender Singh by moving beyond the semifinals when he steps into the ring tomorrow as the lone Indian left in fray at the World Championships in Baku, Azerbaijan. The tall and calculative 19-year-old, whose ring craft belies his tender age, won a thriller of a contest last night to be the only Indian, among four in action, to make it to the semifinals. The Asian Games gold-medallist in the 60kg category is competing in his maiden event since jumping a couple of divisions to 69kg a few months ago but adjustment has hardly seemed a problem for the Haryana-lad. Tomorrow, he is up against Ukraine's European Championship bronze-medallist Taras Shelestyuk, who was impressive in his stunning triumph over third seed Andrey Zamkovy of Russia, but the Indian is far from intimidated. "All the boxers in this competition are tough, no one can be underestimated. So I presume that he is good and I will strive to give my best against him. It is important to respect your opponent but one should not be intimidated. So when I step into the ring on Friday, I will be confident," Vikas told PTI from Baku. "It is not easy getting a medal at the World Championships. It is a huge event, even Vijender (75kg) managed only a bronze here. I am confident about my game but let's see how things work out. I am definitely aiming for nothing less than a gold," he said referring to Vijender's medal in 2009 edition, which was a first for Indian boxing. It has been by far the most successful World Championships for the Indian team as four boxers managed to make the quarterfinals and with it book their berths for next year's London Olympics. But rookie teen L Devendro Singh (49kg), Commonwealth Games gold-medallist Manoj Kumar (64kg) and CWG bronze-medallist Jai Bhagwan (60kg) had to be content with just that as they lost in the quarterfinals, thereby missing out on medals. Of the four, Vikas has been the best in adaptability. The lanky teen has had the maturity to shift gears and strategy as and when the situation has demanded and that has helped him upstage rivals, who have been left flummoxed on most occasions. "He is very quick when it comes to going from offensive to defensive and vice versa and there lies his strength. This boy is very calm, it is not easy to unruffle him and that is what helps him wriggle out of tough situations," said national coach Gurbax Sigh Sandhu. "I am sure he will give a good account of himself tomorrow because he is confident not cocky. It is a sport in which no one can called a favourite, we have seen the mighty Cubans being knocked out, so you never know what awaits you in the ring," he added. Talking of India's overall show in the event so far, Sandhu said although there is just one medal to show like the last time around, the performance is impressive. "I agree that more medals could have come but I am glad that we have had four Olympic qualifiers from here. It is heartening and the credit for this gradual improvement goes to the support given by the Sports Ministry, the Sports Authority of India, the Indian Boxing Federation and the SAI-supported National Institute of Sports in India. "The sponsors have also done their bit and the boys have not let anyone down. Everyone of my boys has given a good performance even in loss," he said. Indian boxer Vikas Krishnan defeated Moldova's Vasili Belous 9-8 to advance to the semifinals of the World Boxing Championships in Azerbaijan on Wednesday. Krishnan was tied at 3-3 in the opening round, but managed to lead by a point in the next round. It was this point that proved vital in the end. He will meet Ukrainian Taras Shelestyuk in the semifinal on Friday. "In the first round, I saw my strategy not really working well so in the second round I went from being defensive to counter attacking," Vikas said. Coach Gurbax Singh Sadhu was happy with the performance of all his boxers in the Championship. "This championship has so far been the best for our boxers as four of them have qualified for the Olympics. Vikas has ensured us of a bronze now. He fought very aggressively and dominated most of the bout but it didn't show in the score. The level of confidence in the Indian camp is very high." While Vikas made it through to the next round, the other three boxers- Jai Bhagwan (60kg), Manoj Kumar (64kg) and Devendro Singh (49kg) could not make it to the next round. Jai Bhagwan lost 10-11 to Gani Zhailauov. "After the end of the final round we thought Jai had won. But when we saw the scores Jai had lost by the smallest margin. He was leading by a point in the opening round. And by the end of the match it was all about a point," Sandhu said. While Jai fought a close battle, Manoj and Devendro were beaten easily. England's Thomas Stalker defeated Manoj 24-18 to seal a place in the last four. And Devendro was beaten 16-28 by Korean Shin Jong.